This sculpture is a gift from the Government of Luxembourg and was presented to the United Nations in 1988. 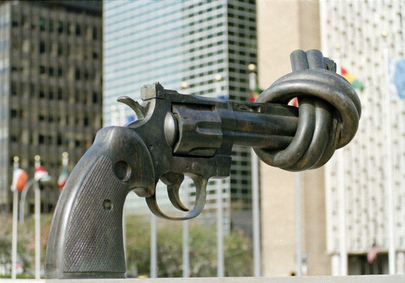 It consists of a large replica in bronze of a .45-calibre revolver, the barrel of which is tied into a knot. It was created in 1980 as a peace symbol by Swedish artist Carl Fredrik Reuterswärd, and is located at the Visitors' Plaza, facing First Avenue at 45th Street.